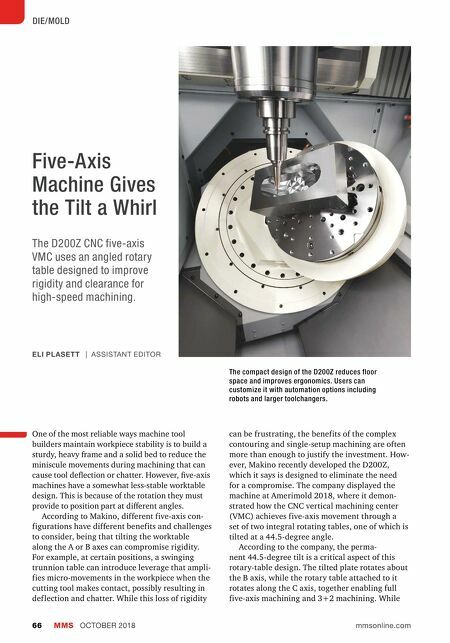 MMS OCTOBER 2018 66 mmsonline.com DIE/MOLD Five-Axis Machine Gives the Tilt a Whirl The D200Z CNC five-axis VMC uses an angled rotary table designed to improve rigidity and clearance for high-speed machining. One of the most reliable ways machine tool builders maintain workpiece stability is to build a sturdy, heavy frame and a solid bed to reduce the miniscule movements during machining that can cause tool deflection or chatter. However, five-axis machines have a somewhat less-stable worktable design. This is because of the rotation they must provide to position part at di•erent angles. According to Makino, different five-axis con- figurations have different benefits and challenges to consider, being that tilting•the worktable along the A or B axes can compromise rigidity. For example, at certain positions, a swinging trunnion table can introduce leverage that•ampli- fies•micro-movements•in the workpiece•when•the cutting tool makes contact, possibly resulting in def lection and chatter. 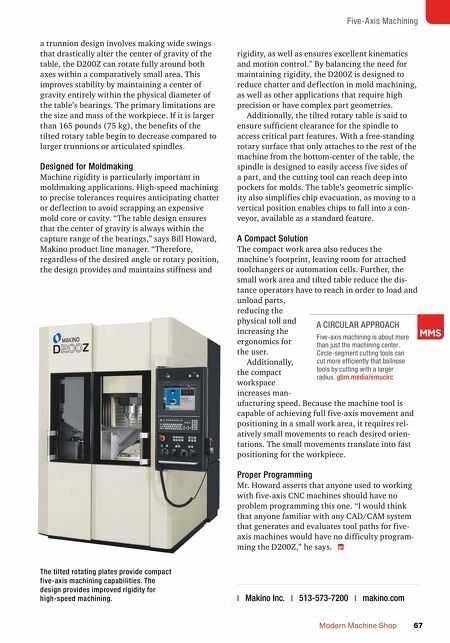 While this loss of rigidity can be frustrating,•the benefits of the complex contouring•and•single-setup machining are often more than enough to justify the investment.•How- ever, Makino recently developed the D200Z, which it says is designed to eliminate the need for a compromise. The company displayed the machine at Amerimold 2018, where it demon- strated how the CNC vertical machining center (VMC) achieves five-axis movement through a set of two integral rotating tables, one of which is tilted at a 44.5-degree angle. According to the company, the perma- nent•44.5-degree tilt is a critical aspect of this rotary-table design. The•tilted•plate rotates about the B axis, while the rotary table attached to it rotates along the C axis, together enabling•full five-axis machining and 3+2 machining.•While ELI PLASETT | ASSISTANT EDITOR The compact design of the D200Z reduces floor space and improves ergonomics. Users can customize it with automation options including robots and larger toolchangers.